The recent uncovering of the petrified forest at Redcar has been the subject of much media attention, with news crews and visitors swarming over the beach taking photos. The last time I remember seeing it, was back in the early days of this website in 2007 when there was only me taking photos, although to be honest it was nowhere near as spectacular as this time around. With the huge number of wrecks that occurred in the past, its going to be difficult to know. 03/11/1807 During heavy gales, no less than 17 ships became stranded on Coatham sands. 02/02/1831 On this date 12 vessels were driven ashore at Coatham sands with dozens of lives lost. 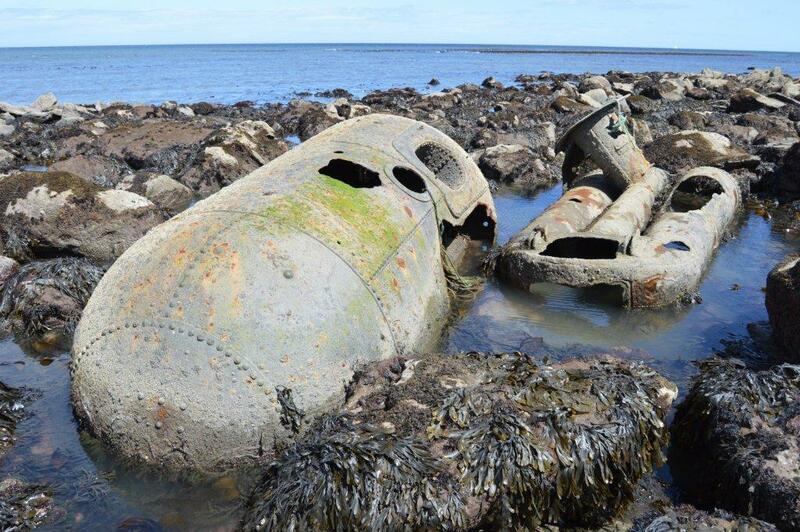 Wreckage from these vessels was evident along the beaches of Redcar and Marske. The Waldridge was a British steamship, built in Sunderland in 1868. She was owned by Edwin Robert Dix, of Sunderland. Many thanks to Wayne Martin for the photos. This vessel left the Tyne about 4 p.m. on the 30th January 1895 with a crew of fifteen hands all told and a cargo of about 900 tons, of which 180 tons were bricks and the remainder coal, bound for Boulogne. At about 2 a.m. on the 31st January, the vessel then being about six or seven miles from Whitby, the second engineer, who had had charge of the engines since midnight, finding that the ship was making water, put on the donkey-engine and called the chief engineer, who on going down into the engine-room and seeing the condition of things at once put on the bilge injection, but notwithstanding these efforts he failed to reduce the water and it gained on him; he then sent for the captain, who immediately came down into the engine-room, the water at this time washing up the stoke-hole plates and threatening to extinguish the fires. After consultation with the chief officer and chief engineer the master determined to put back to Hartlepool, and with that view put the helm hard-a-port and wore the ship round. Shortly after this the lower fire was extinguished, and the water continuing to gain. the steam went back and the engines finally stopped at about 5 a.m. Attempts had been made to light the fire of the donkey-boiler on deck, but the constant washing of the seas prevented this being done. in the meantime signals of distress were made and the port lifeboat cleared away, but in consequence of the breaking of a belaying pin to which the after fall was attached the boat fell into the water and was smashed. The ship at this time was perfectly helpless, the wind having backed to the E.N.E., with heavy seas constantly breaking over her. The stay sails were set with a view to help her on to the shore, the master fearing the vessel would founder. At about 8 a.m. the vessel took the ground about 200 yards north of Port Mulgrave, a mile and a half to the southward of Staithes, it being then about an hour after high water and daylight coming on. The ship swung round with her head to the southward, whereupon the starboard lifeboat was cleared away; two men got into her, but none of the others would follow, the master stating that it was his intention to stay by the ship for the present. The men in the lifeboat then cut the painter, and the boat drifted ashore and the men were saved. Shortly after this the carpenter, Peter Haysom, who was a good swimmer and had a lifebelt on, determined (against the advice of the master) to attempt to swim ashore, but he was drowned when 40 or 50 yards from the ship. After the ship had been on shore about half an hour the rocket apparatus from Staithes arrived at the top of the cliff, which is 350 ft. high. Two rockets and the breeches buoy were taken down to the beach, and the first rocket fired fell across the quarter, but the line caught in a rock and broke; the second rocket fell short. A third rocket was sent for and fired, which fell right across the vessel’s bows. She had then parted amidships, and it was decided to attempt to land the crew with the whip alone, as it was thought the hawser would not reach the vessel, and there being no place at that time on which the triangle could be fixed. The first man to leave the ship in the breeches buoy was James Clarke, A.B., who was unfortunately drowned before reaching the shore in consequence of a piece of canvas getting into the block and the rope having fouled a rock. In the meantime, the body of the carpenter had washed ashore, and efforts were made by Dr. Laverick, the local secretary of the Staithes Lifeboat Institution, to restore animation, but without success. The tide having by this time receded considerably, it was found that the triangle could be fixed, and, the hawser would reach the ship; this was successfully accomplished, and the remainder of the crew were landed in safety, the last man to leave the ship being the master. The Admiral Van Tromp was a Scarborough trawler that ran aground on 30/09/1976. The exact circumstance of the accident remain a mystery as the boat was on completely the wrong course and a senior nautical surveyor at the inquest stated it appeared it was driven onto the rocks deliberately. No-one will ever know the real reasons as the man at the wheel John ‘Scotch Jack’ Addison was killed, along with one other crew member. 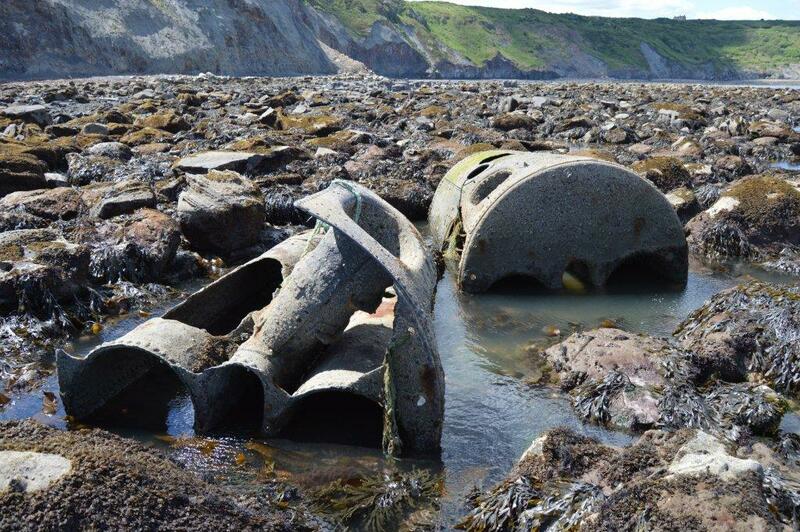 Again, check the tide tables before visiting wreck sites and needing a rescue yourself. The Rohilla was launched by Harland and Wolff in Belfast on the 6th September 1906. On 6th August 1914 she became a hospital ship. A few fragments of the ship can be found to the west of Saltwick Nab, although care should be taken to check tide tables before visiting. Much more of the wreck remain still under the water. The whole area around Kettleness is heavily scarred by industry (despite now being very picturesque) there are workings for Jet, Alum, Ironstone and Cementstone all in a small area. Ironstone was quarried on the foreshore and around the edge of the headland there are many inaccessible jet workings located high in the cliff. The headland has also taken victim much shipping over the years, with two wrecks identifyable. I’ve had this scrap of paper that I bought from the lifeboat shop for at least 20 years, I’ve rewritten the legend but the rest is straight from the original. I’ve not yet found any record of the ships name, or date it was wrecked. The remains of the ship can be seen depending on the tides and sand levels.